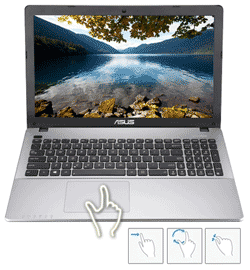 Asus VivoBook X550CA Touchscreen Laptop Core i5-3337 15.6" 8GB RAM 1TB HDD DVDRW. Reliable and comfortable to use, the X Series notebook has a Zen-inspired concentric circle finish for a classy, elegant feel. Its slim profile is 5% thinner than the previous X Series notebook. X550 is an ideal machine for both productive computing and entertainment. Using Intel Core i5 processor, the X550 delivers smooth, responsive performance that is more than adequate for daily multitask computing or multimedia entertainment. 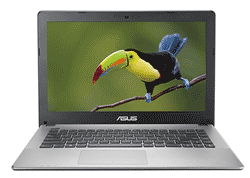 The X550 features the Asus Super Hybrid Engine II with instant on to provide you with smartphone-like levels of accessibility. It can resume from sleep mode in just two seconds and has up to 14 days of standby time. It automatically saves your data when battery levels drop below 5%, so your documents are kept safe and secure. The X550 comes with USB 3.0 to give you ultra-fast data transfer speeds that are up to 10 times faster than USB 2.0. All your files and content can be copied and backed up in seconds. Say goodbye to long waiting times -- transferring a 25GB Blu-ray-quality movie takes a mere 70 seconds. On most notebooks, all sound frequencies originate from small onboard speakers. The resulting audio comes from a single source and lacks distinctiveness. Like other notebooks in the Asus range, the X550 comes equipped with SonicMaster technology to bring you high fidelity audio. Experience omnidirectional sound and hear each individual instruments nuances with the X550. Splendid technology delivers vibrant visuals to satisfy the most demanding viewing standards. It fine-tunes display properties based on application, adjusting colour gamut and accuracy. The results are more vibrant colours and pristine image quality in all applications, from movies to photos. Splendid technology provides four modes to accommodate different viewing conditions, so you can choose the most suitable pre-set based on personal preference and environment. The back-assembled, seamless one-piece keyboard prevents key float to provide you with a comfortable and assured typing experience. The Chiclet keyboard design spaces out the keys to provide an improved layout that ensures typing accuracy. Each individual key has been expertly tuned to Asuss Golden Ratio of keyboard force and stroke to increase key responsiveness. These details add up to reduce user fatigue even after prolonged periods of typing. The X550 has a large touchpad equipped with Smart Gesture technology for quick and precise response across a wide range of touch inputs like pinch-zoom, drag-and-drop, and multi-finger page manipulation. The X550 features a webcam with a highly-sensitive sensor with exceptional low-light performance. It allows you to keep in touch with friends and family through smooth 16:9, full screen video conferencing. Asus WebStorage ensures you get access to your data and files on any device that has an internet connection. With Asus WebStorage, your files are automatically kept up-to-date and synced across various devices; you can share photos and videos with friends and family, and stream your music and movies to your device. The X Series comes with three years of free 32GB of Asus WebStorage.